To make the pea purée, heat the oil in a saucepan and cook the onion for 10 minutes, until softened. Add the wine, stock and peas, bring to the boil and simmer for 5 minutes. Transfer to a food processor and blend until chunky. Stir in the mint and allow to cool. To make the risotto, bring the stock to the boil in a pan. Reduce the heat, cover and simmer. Heat the olive oil in a large saucepan and cook the onion and garlic for 5 minutes, until softened. Add the rice and stir until coated. Pour in the wine and bring to the boil, stirring until absorbed. Stir in a ladleful of the simmering stock, cooking and stirring over a low heat until absorbed. Continue adding the stock in ladlefuls, stirring, until all the liquid is absorbed and the rice is tender. Meanwhile, pour 4cm sunflower oil into a large frying pan and heat until hot. Add the courgette strips and fry for 5 minutes, until golden. Using a slotted spoon, transfer to a plate and drain on kitchen paper. Keep warm. 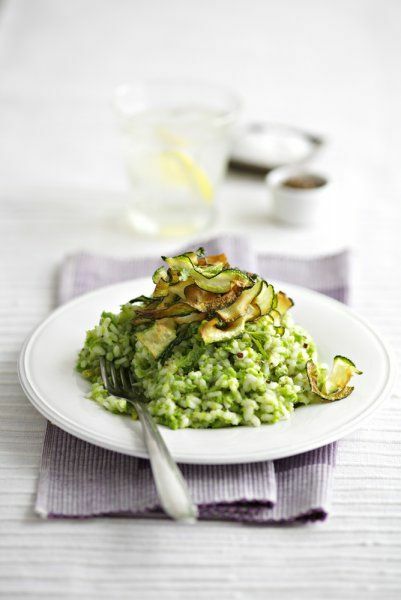 Stir in one-third of the pea purée and serve the risotto immediately, topped with the courgette strips. Allow the remaining pea purée to cool completely. Divide the mixture in half and spoon into freezer bags. Seal and freeze.